The “Highest Quality” Football Kicking Tees and Kicking Tee Blocks For Placement Kicks Ever Made! The kicking tee block is ideal for the high school level kicker when kicking extra points and field goals. Up through high school, kickers are allowed to use a one or two inch elevated placement kicking tees. Once the high school kicker moves on to the college level, he’s no longer allowed to use any sort of placement kicking tees for extra point and field goal kicks. For Field Goals and Extra Points. 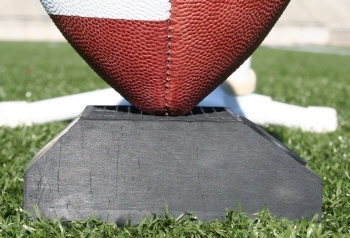 The Wilson 2″ placement tee (kicking block) is the standard size approved for kickers competing through the high school level of play. The extra weight designed into this kicking block provides the holder the most dependable “ball support” surface ever made. Kickers can always expect optimum positioning for maximum height and distance on every kick. The Wilson 2″ placement tees are rubber and manufactured in the color black. NO OTHER placement tee in the market place is made of this quality. The added weight along with the rigid design on the bottom and the grid design on top insures a solid, firm placement every time. No matter the field surface or weather condition, the Wilson 2″ placement tees are the “kicking blocks” you can depend on!